American Political Science Review is political science's premier scholarly research journal, providing peer-reviewed articles and review essays from subfields throughout the discipline. Areas covered include political theory, American politics, public policy, public administration, comparative politics, and international relations. 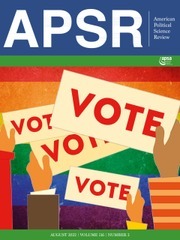 APSR has published continuously since 1906. American Political Science Review is sold ONLY as part of a joint subscription with Perspectives on Politics and PS: Political Science & Politics.